In the early 1990s, the First National Bank of Keystone in West Virginia began buying and securitizing subprime mortgages from all over the country, and quickly grew from a tiny bank with just $100 million in assets to over $1.1 billion. For three years, it was listed as the most profitable large community bank in the country. It was all a fraud. All of the securitization deals the bank entered into lost money. To hide that fact, bank insiders started cooking the books, and concealing that they were also embezzling millions of dollars from the bank. This was all hidden from the bank's attorneys and auditors, federal bank examiners, and even the board of directors of the bank. To keep the examiners at bay, the bank insiders did everything possible to avoid giving them access to documents they were entitled to see, documents they knew would sink their scheme. The head of the bank even went so far as to bury four large truckloads of documents in a ditch on her ranch. 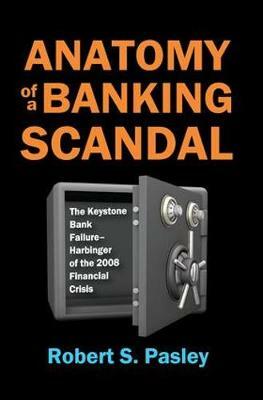 Robert S. Pasley explores the failure of the First National Bank of Keystone, the intrigue involved, and the lessons that could have been learned-and still can be learned-about how banks operate, how federal banking regulators supervise financial institutions, how agencies interact with one another, and how such failures can be avoided in the future. "Anatomy of a Banking Scandal is a must read for anyone in the Anti-Money Laundering or Financial Crime Prevention fields. Robert Pasley takes you into a world of corruption, intimidation, and arrogance that was the First National Bank of Keystone. You will also be astounded at how regulators and outside auditors failed in their supervisory and oversight roles that allowed the bank to thrive. Fortunately, the scandal was eventually uncovered, but the trip there will teach you quite a bit. Pasley's book is the perfect precursor to The Big Short and should go down as an excellent anti-fraud training tool."